Very Rare Quad poster for this classic film. Overall very good condition for age, some edge wear usual folds.. Ultra ultra rare hardly see these any more! Size measures 30x40 inches, incredible Poster!! 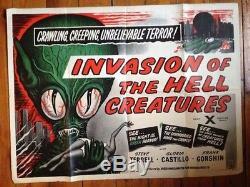 The item "Invasion Of The Hell Creatures Invasion Of The Saucer Men Original UK Quad Rare" is in sale since Tuesday, March 25, 2014. This item is in the category "DVDs, Films & TV\Film Memorabilia\Posters\Originals - US One Sheets\Pre-1970". The seller is "bluerobin76yakob" and is located in Berlin. This item can be shipped worldwide.